Please note the payment must be from the original card, and the cardholder must be present at check-in. All guests to provide a 50 EUR pre-authorisation on a card or 50 EUR cash for incidentals. 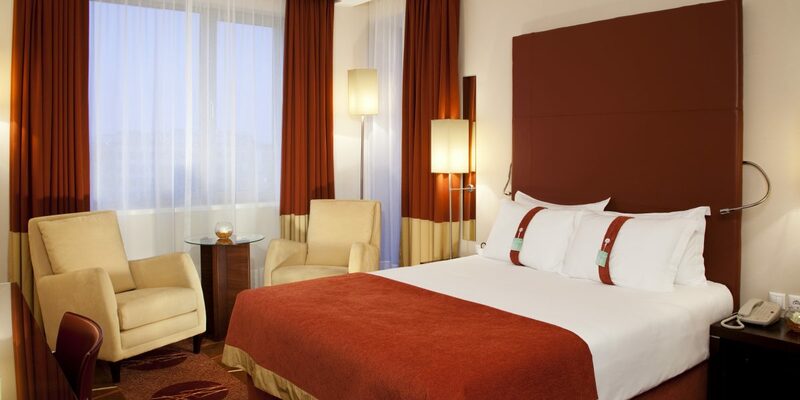 The Holiday Inn Sofia offers 130 luxurious spacious bedrooms, including Executive Rooms and Suites, many with breathtaking views of the imposing Vitosha Mountain. 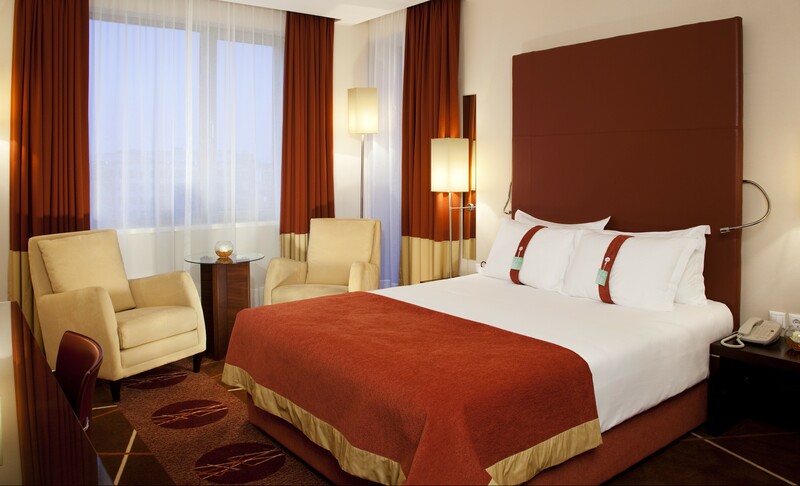 Unwind in your fresh and contemporary Standard Room; relax in your spacious Executive Room decorated in rich and warm tones or indulge in your luxurious Suite, the choice is yours. 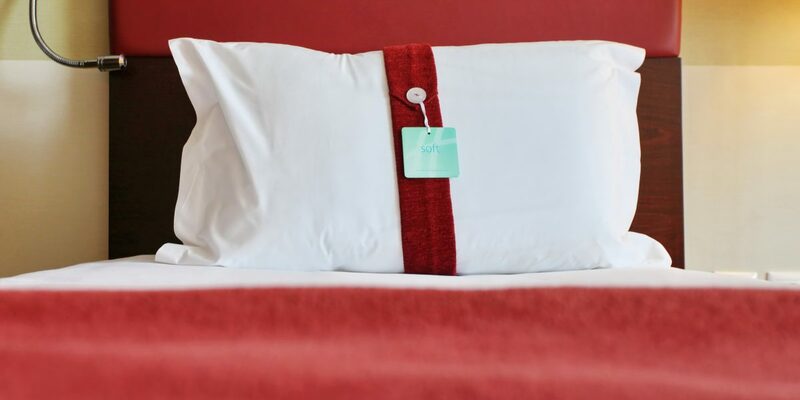 All hotel rooms are en suite with separate bath and shower, and provide air-conditioning, flat screen TV with wide selection of channels, courtesy tray, mini bar, hairdryer, ironing board and bedroom safes. There is a comfortable work desk and high speed wired and wireless (Wi-Fi) Internet access offered in the rooms, with Wi-Fi Internet access also offered throughout all meeting rooms and public areas. Tel: +359 (0) 2 807 07 07 / E-mail: info@holidayinnsofia.bg or use the buttons on the left – “BOOK NOW” for online reservation or “Contact Us” for enquires. the capital of Bulgaria, filled with exciting museums and art galleries, wonderful restaurants and heritage, dating back hundreds of years. 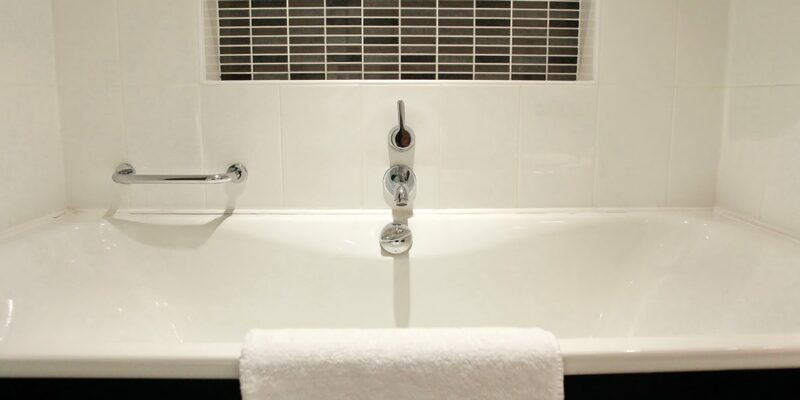 All hotel rooms offer a separate bath and shower, and provide air-conditioning, flat screen TV with wide selection of channels, courtesy tray, mini bar, hairdryer, ironing board and bedroom safes. 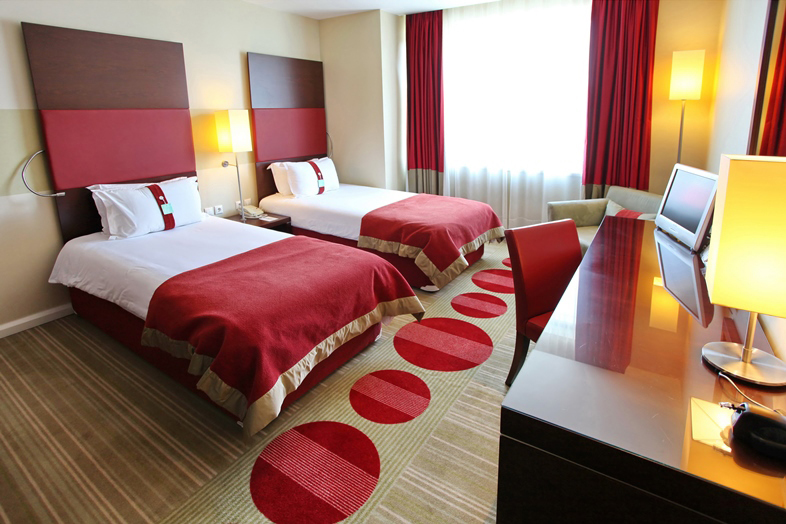 There is a comfortable work desk and high speed wired and wireless (Wi-Fi) Internet access. Wake up to lake or mountain views and start your day with an invigorating power shower, catch up on work with wireless internet in your contemporary room relax with complimentary movies on the flat screen TV and enjoy a refreshing drink from the minibar. 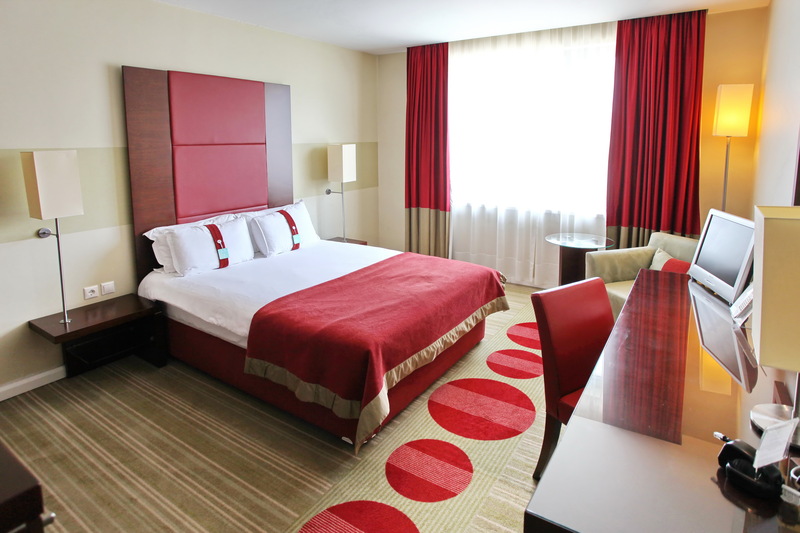 All rooms provide air-conditioning, hairdryer, ironing board and bedroom safes. Your colorful, spacious Family Room with Queensize bed and sofa bed i adorned with specially designed artwork, a comfortable work desk with high speed internet, both cabled and Wi-Fi. 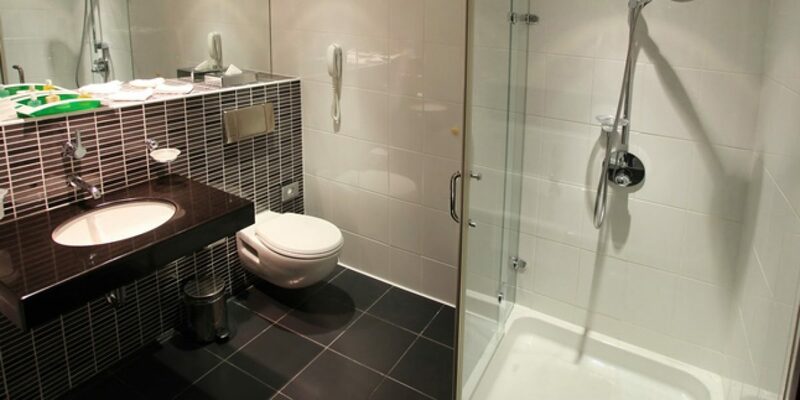 Luxury toiletries and a power shower help you to unwind. You might easily got some privacy by adding a connected room for the kids. Spacious and extremely comfortable, air-conditioned bedrooms, offering a Queensize bed, working desk, two comfortable chairs with table and separate bath and shower. Distinguished for their refined interior in warm yellow and light brown tones, completed by original contemporary artwork. 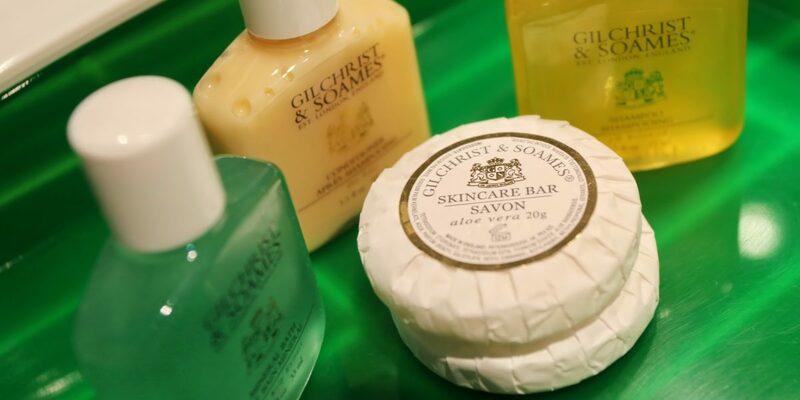 While staying in an Executive Room, our guests also receive a luxurious bathrobe and Gilchrist & Soames toiletries, a complimentary fruit basket and mineral water, one hour free internet card, as well as complimentary round trip to/from Sofia Airport. The King Suites in Holiday Inn Sofia hotel are situated on the top floor, filled with light and offering a panoramic view over the adjacent lake. 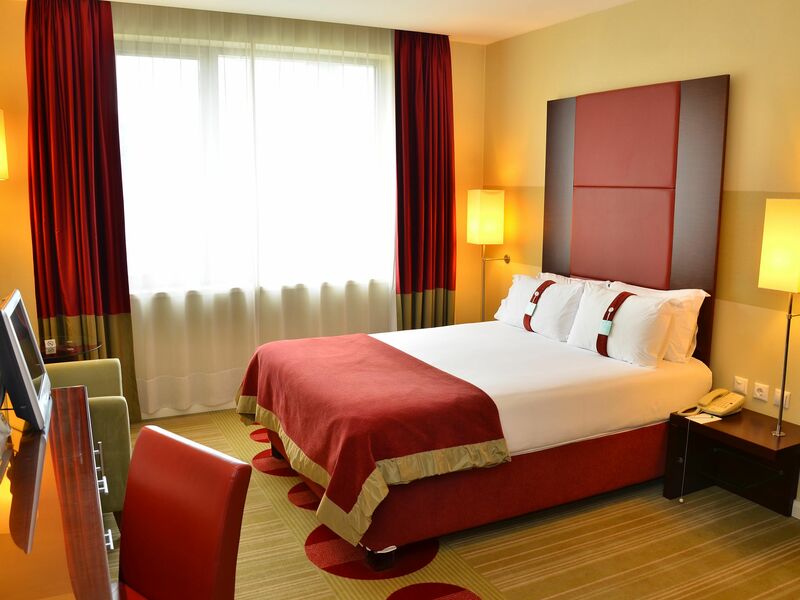 King Suites consist of two spacious rooms with a large bathroom, and are magnificently designed to provide a relaxed atmosphere. 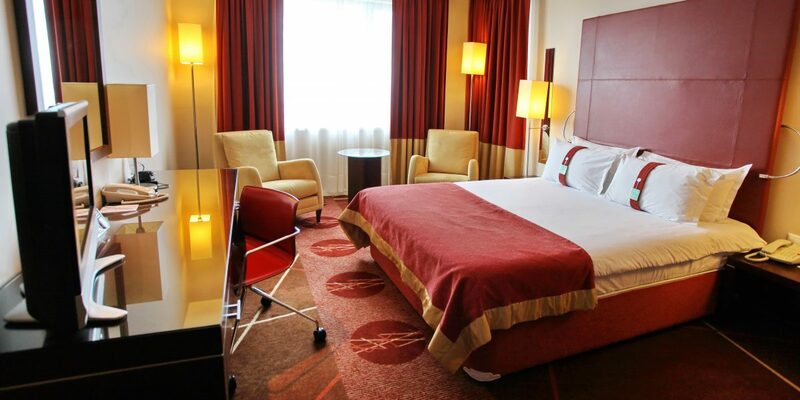 Bedrooms are modernly equipped with a King-size bed, double wardrobe and working desk. The separate living room is conveniently furnished with a comfortable sofa, two soft armchairs and separate dinning table with chairs. The spacious bathroom has a separate feature bath & walk in shower cubicle with the added benefit of double feature vanity units. Full buffet breakfast for up to two adults when sharing a room as well as high speed wired and wireless internet throughout the hotel. Cancellations and modifications can be made free of charge until 16:00h local hotel time on day before arrival. If cancelled or modified later, 1 night penalty fee applies. High speed wired and wireless internet throughout the hotel. Book 7 days in advance for minimum of 5 nights and save 20% of our Breakfast Flex. 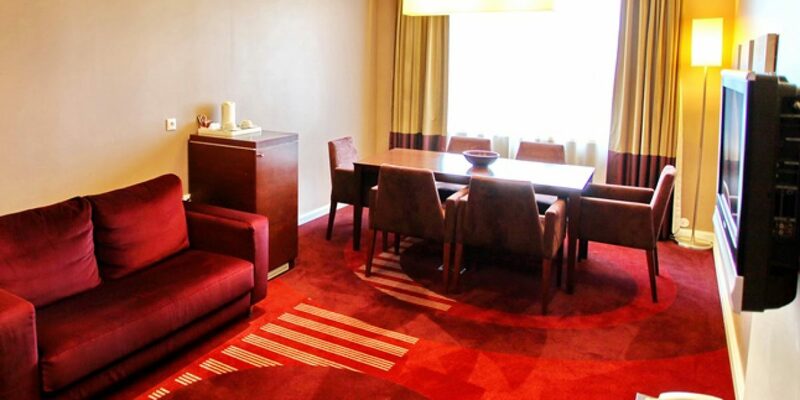 Full buffet breakfast for up to two adults when sharing a room included in the rate. The offer is valid for sertain periods of the year only. Rate includes room and 1000 bonus points per night. 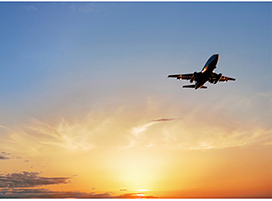 If you collect miles with participating airlines point convert to miles. Bonus will fullfill authomaticaly. Rate is bookable online only and IHG RC membership is required. Cancellations and modifications can be made free of charge until 16:00h local hotel time on day before arrival. If cancelled or modified later, 1 night penalty fee applies. 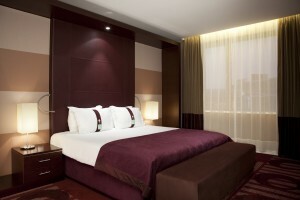 Rate includes full buffet breakfast for up to two adults when sharing a room as well as 1000 bonus points per night. If you collect miles with participating airlines point convert to miles. Bonus will fullfill authomaticaly. Rate includes room and 2000 bonus points per stay. If you collect miles with participating airlines point convert to miles. Bonus will fullfill authomaticaly. Rate includes room and 4000 bonus points per stay. If you collect miles with participating airlines point convert to miles. Bonus will fullfill authomaticaly. Rate includes room and 5000 bonus points per stay. If you collect miles with participating airlines point convert to miles. Bonus will fullfill authomaticaly. Rate includes full buffet breakfast for up to two adults when sharing a room as well as 5000 bonus points per stay. If you collect miles with participating airlines point convert to miles. Bonus will fullfill authomaticaly. Accommodation as well as roundtrip airport shuttle upon prior request and availability. The rate includes accommodation and 200 airline miles per night. Miles will be fulfilled electronically. Restrictions may apply. The rate includes accommodation and full buffet breakfast for up to two adults when sharing a room as well as 200 airline miles per night. Miles will be fulfilled electronically. Restrictions may apply. The rate includes accommodation and 1000 airline miles per stay, which will be fulfilled electronically. Maximum length of stay is 4 nights. You’re often on the go and you need to be able to book hotel stays for business trips, weekend getaways and more on the fly, whenever and wherever you have time. Luckily, IHG® offers some great apps for your iPhone®, Android™, BlackBerry®, Windows® Mobile Phone or iPad®, as well as the IHG® mobile website for all other web-enabled mobile devices. Get the inside track on InterContinental® Hotels & Resorts destinations with our Downloadable Concierge for the iPad. 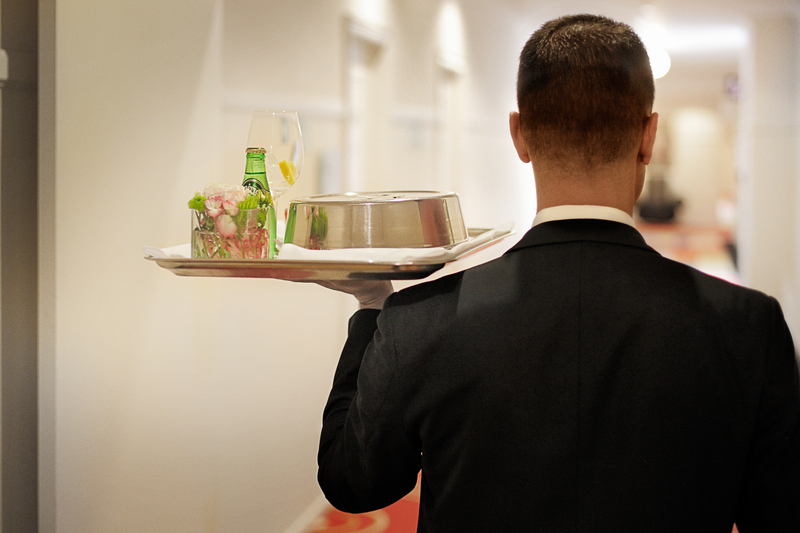 You’ll enjoy true inside information from our world-class concierges as well as VIP tickets to events. Find out more and download the app by selecting the iPad icon above. If you just need to book or make changes to a IHG® hotel stay when you’re away from your computer, you can do so easily by accessing the IHG® mobile website. Learn more about what the IHG® mobile website has to offer! Cancellations and modifications can be made free of charge until 16:00 h local hotel time on day before arrival. If cancelled or modified later, 1 night penalty fee applies. Package is valid Thu-Sun. Book your Relaxing Spa Escape and enjoy a bottle of Prosecco with nicely arranged fruit skewers upon your arrival. The package is inclusive of a 45 minutes relaxing massage on Saturday or Sunday afternoon as well as free access to our Esprit Fitness and Spa facilities – brand new 19 m. indoor pool, fitness, Jacuzzi, sauna and steam bath. 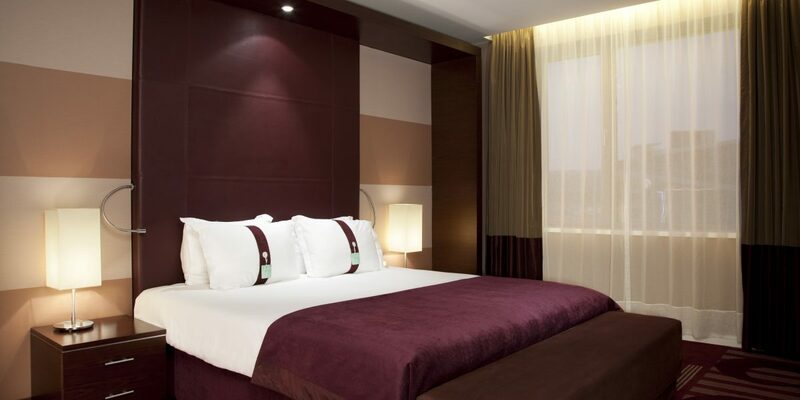 In addition to the above you can take advantage of a complimentary full buffet breakfast for up to 2 adults sharing a room every morning and free underground secured parking. The package is inclusive of one massage per person per stay for up to two adults sharing a room. Please reserve your massages in advance as they will be arranged upon prior request and availability. Appointments could be accepted for Saturday or Sunday between 12:00 and 20:00 h only. The rate is prepaid and non-refundable in case of cancellations/modifications or no-shows. The prepayment is charged to your credit card between time of booking and the arrival date. Package is valid for minimum of 2 nights on Friday, Saturday and / or Sunday. Cancellations and modifications can be made free of charge until 16:00h local hotel time on day before arrival. If cancelled or modified later, 1 night penalty fee applies. Package is valid Thu-Sun. The package is bookable online only. Second room is with 50% discount in case the accommodation is for your kids under 18 years old and in case it is booked for the same period and room rate. Package includes full buffet breakfast and internet access for up to two adults sharing a room. Enjoy your free night in Sofia. Pay for 2 nights and stay 3. 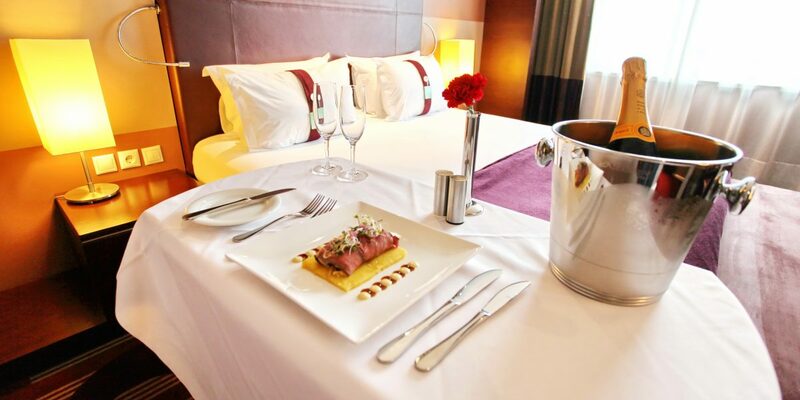 The package includes full buffet breakfast every morning and two 3-course dinners per stay from our daily set menu for up to two adults sharing a room. One mineral water or soft drink per person is compliment during the dinners. It is also inclusive of free internet throughout the hotel, late check-out until 16:00h and free upgrade to Family room upon availability. Do not miss to take advantage of our 19m indoor pool, fitness, sauna, steam bath and jacuzzis as a compliment. The rate is prepad and non-refundable in case of cancellations/modificaions or no-shows. The prepayment is charged to your credit card between time of booking and the arrival date. Package is valid Thu-Sun. Minimum 3 nights stay required. Due to technical reasons the total amount is spread among the three nights. The rate includes accommodation as well as roundtrip airport shuttle upon prior request and availability. 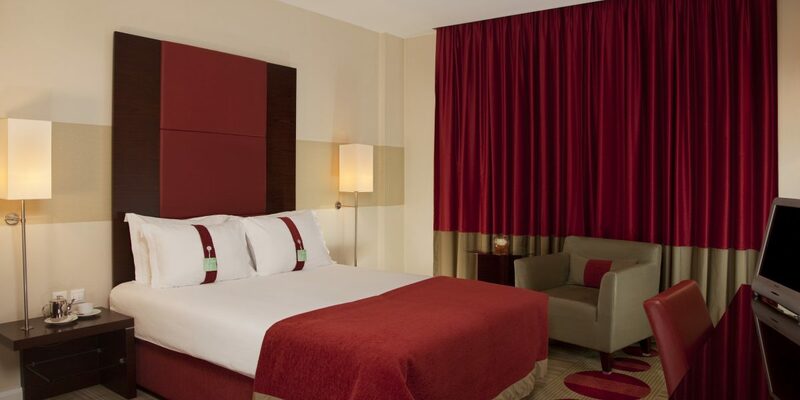 Take the stress out of travelling with our Park, Stay & Go package, which includes one night accommodation and up to 15 nights parking at our conveniently location. Any additional days parking will be charged at the applicable rate. 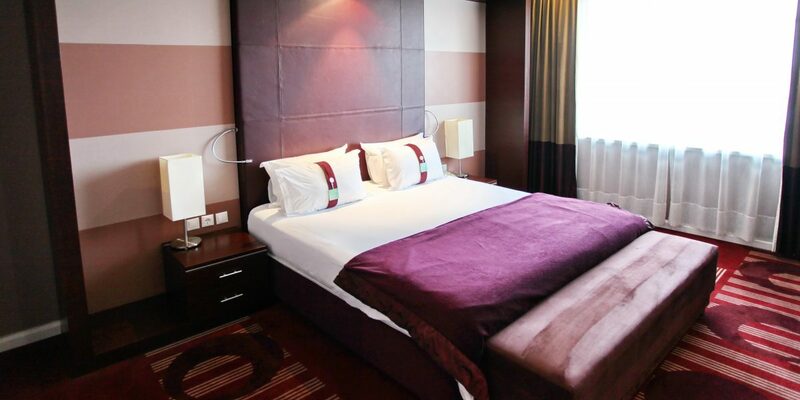 Package includes one night accommodation and up to 8 nights parking at our conveniently location. Any additional days parking will be charged at the applicable rate. The rate is prepad and non-refundable in case of cancellations/modificaions or no-shows. The prepayment is charged to your credit card between time of booking and the arrival date. 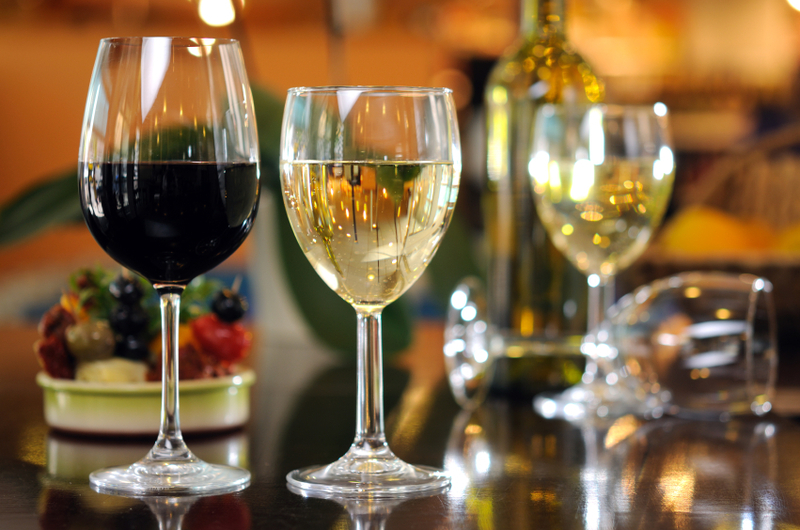 Group Events encompass all sorts of get-togethers, from sports teams to family reunions. Perhaps it’s a 50th birthday party. Or maybe you simply need a room block for your baseball team. 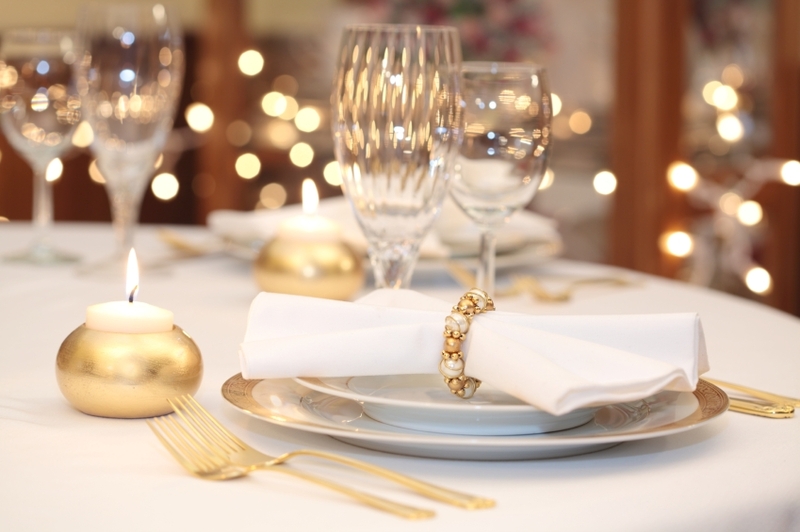 They’re all considered Group Events, and Holiday Inn Sofia can help – from the initial contact until the event wrap-up. We can help you make it fun. 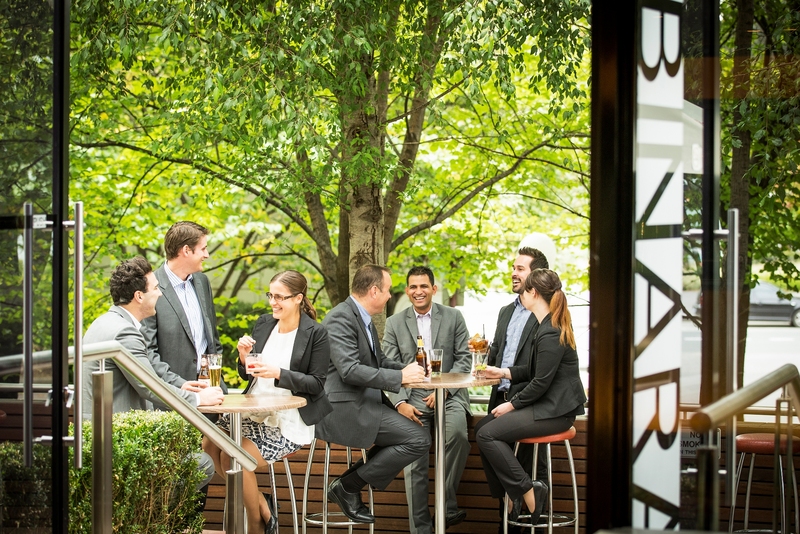 Whether you’re hosting a sales meeting or an informal get-together with associates, we understand what goes into planning and hosting a meeting. We can help you – from the initial contact until the meeting conclusion. Great group rates will help you meet your budget. 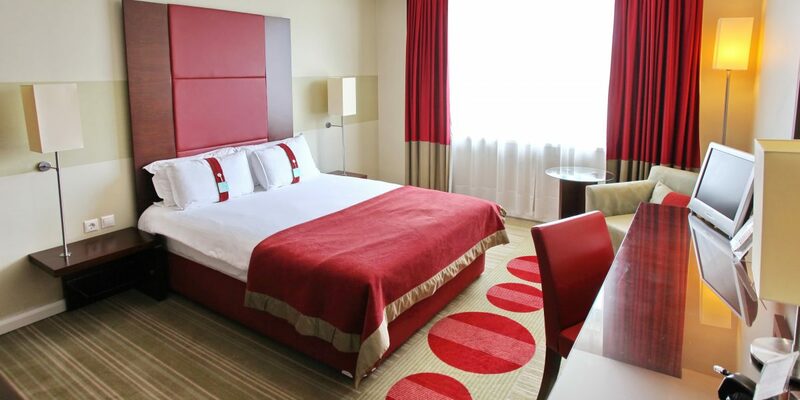 Location-Holiday Inn Sofia – The most connected and convenient hotel in Sofia! With the new Metro Station just 200m from the hotel, guests can gain thunder-speed access to the City Centre, Sofia Airport and all main Business and Leisure locations in Sofia. Via the Ring Road the hotel is easily accessible for visitors from Bulgaria and travelers using the major transport corridors 4, 7, 8, 9, 10 and TINA which pass through the country and makes it the junction that connects the European Union & EFTA with Russia & CIS, Turkey and Middle East. 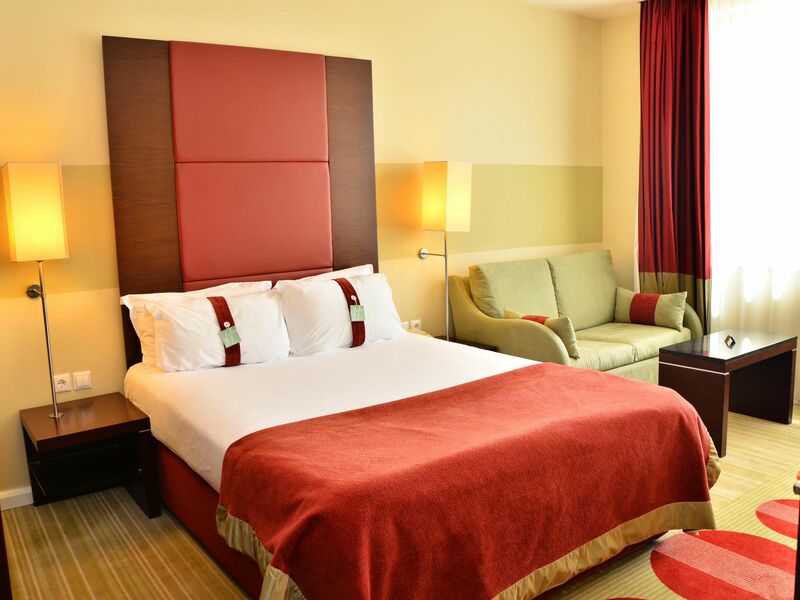 Holiday Inn Sofia is a mere 3 hour flight from all major destinations in Europe, Russia and Mediterranean region and just 10 minutes from the Sofia Airport via the Hotel Shuttle Bus or the new Metropolitan link. – 130 spacious guests rooms with Wi-Fi, New high definition flat screen televisions, satellite channels and laptop size safes. Plan it! Make it happen! The world’s first and largest hotel loyalty program gives its members unparalleled choice and flexibility to earn and redeem points for merchandise and stays at more than 4,700 IHG hotels in nearly 100 countries globally. Our goal is to see you get what you want. That’s why redeeming your points for Reward Nights, travel, merchandise and more is as easy as possible. When you are part of the IHG® Rewards Club, you enjoy exclusive member benefits at every level. A great rate that allows flexibility in your stay – find out more. 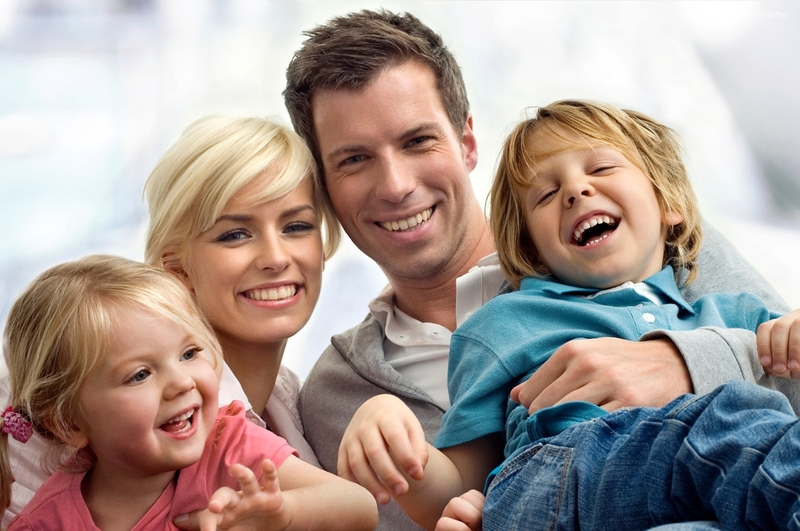 Kids Stay* and Eat Free** at all Holiday Inn® hotels and Holiday Inn Resort® hotels. 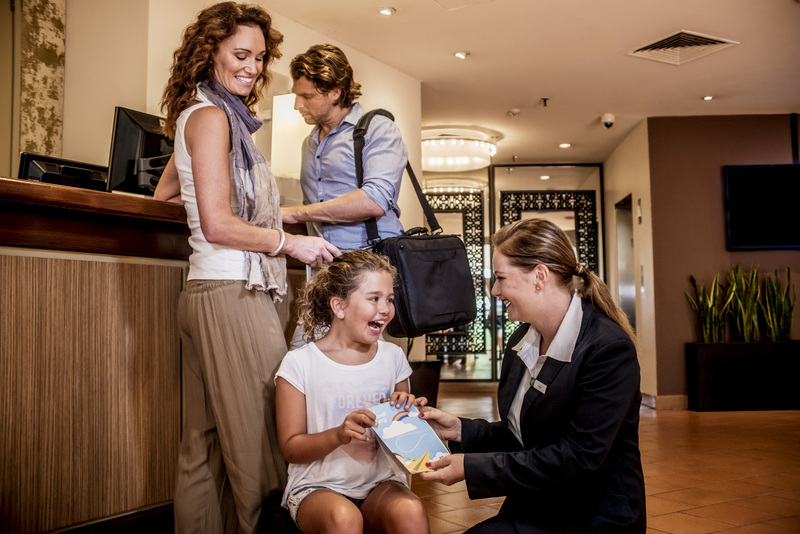 It’s something our family-friendly hotels include, because we like making travel easier for you. Of course, we can’t promise you won’t end up with a hefty investment in souvenirs from the trip. Those pressed pennies can really add up. Price per person one way: 7.20 EUR. Please note that the shuttle bus is subject to availability and must be pre-booked in advance. Alternatively, you can use the services of OK Supertrans Taxi. We strongly recommend our guests to check the published tariff before taking a taxi from the airport if they are not using the hotel shuttle. High-speed wired and wireless Internet is available in all guestrooms in addition to internet deskhubs for an excellent browsing experience. High-speed wireless Internet is also available throughout the hotel allowing you to stay connected. Dry Cleaning /Laundry Pickup is available every Monday to Friday (excluding Bank Holidays).For same day service, laundry bags must be left at reception by 09:00 and will be returned after 18:00. Luggage storage is available for hotel guests. From Insider tips to the City’s top attractions, or reservations for Sofia’s finest restaurants, you can always rely on our competent and experienced team. Available 24/7 in the comfort of your room. Copy of the front and back of the card; Number of credit card; Expiry date and security code;Signature of the cardholder; All remaining accounts are due at time of check out. Nice hotel, friendly staff, good rooms….I have stayed here frequently, and have never been disappointed by the quality of the hotel. “Great surprise” This was my first visit to Bulgaria, and I did not expect too much from this Holiday Inn hotel. But the moment I entered the building I experienced soo many surprises. The staff was very kind, the hotel was really clean, modern and well-equiped. The gym was also quite big and full of “gadgets”. I did not try the pool unfortunately but as I saw it that was also nice. The room was really spacious, the bathroom also. And I had the finest breakfast for a long time. Good hotel in a quiet location. Near the foot of the Vitosha mountain. It is a 15-minute taxi ride to the top of the mountain where a splendid view of the city. accommodation in this hotel is worth it. 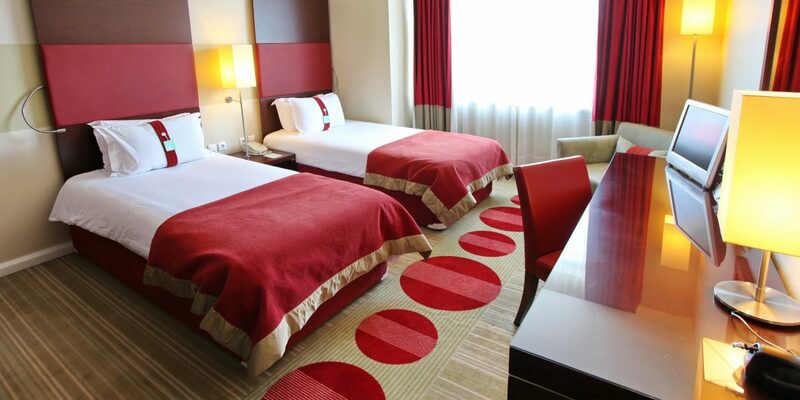 Spacious room, satellite TV channels, courteous staff. A spa area, which is free for hotel guests. In the morning a hearty breakfast. Spacious, clean and quiet rooms. Suitable for business travelers .